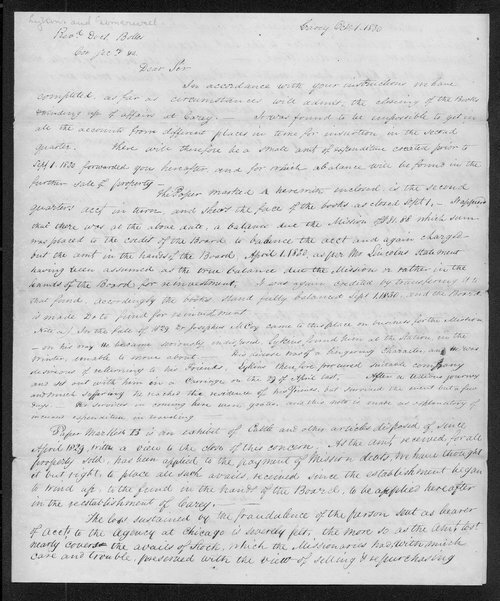 In this letter to Johnston Lykins and Robert Simerwell, Reverend Lucas Bolles reports that the Baptist Board of Missions has received the reports sent by both Lykins and Simerwell and, as a result, the Board is completing the closing of the Books & winding up of affairs at Carey Mission, Michigan Territory. Bolles letter indicates that the educational department of the Carey Mission was closed on August 26, 1830, with 15 scholars in attendance at the time it ceased operations. Bolles reports that the U.S. Government has promised that a new school will be opened in the "new Country" west of the Mississippi and that the Native Americans were being moved there following the passage of the Indian Removal Act of 1830.